Own Merlin - The Complete Collection DVD from Deff, DVD, Blu-Ray & 4K Video Specialists - Free UK Delivery..
Own Merlin And The Book Of Beasts DVD from Deff, DVD, Blu-Ray & 4K Video Specialists - Free UK Delivery..
Own Merlin And The Dragon Empire DVD from Deff, DVD, Blu-Ray & 4K Video Specialists - Free UK Delivery..
Set in the mythical city of Camelot, in a time before history began, this magical adaptation of the Arthurian legend follows young Merlin's enthralling encounters with the young Prince Arthur. Special Features Behind The 'Magic' Parts 1 & 2, The Black Knight Featurette, Cast Video Diaries, Audio Commentaries, Wallpapers and Photo Galleries.. Starring: Colin Morgan, Bradley James, Anthony Head, Richard Wilson, Katie McGrath and Angel Coulby with John Hurt as the voice of The Great Dragon. Merlin is back with even more magic, adventure and romance as the young wizard struggles to protect Prince Arthur in the perilous world of Camelot. Special Features Episodes 1-13 Secrets & Magic: A Behind The Scenes Look At Series Two, Audio Commentaries, Wallpapers, Photo Gallery, Cast & ..
Merlin is back for a fourth series of the hit BBC adventure as Camelot stands on the brink of a golden age. But its birth will not be an easy one. For the forces of evil are gathering and the darkest hour is just before the dawn... This series sees the arrival of the fearless Knights Of Camelot and a fantastic guest cast featuring Gemma Jones (Bridget Jones' Diary, Harry Potter), Phil Davis (Doctor Who, Brighton Rock) and Nathaniel Park..
Merlin is back for a fourth series of the hit BBC adventure as Camelot stands on the brink of a golden age. But its birth will not be an easy one. For the forces of evil are gathering and the darkest hour is just before the dawn… This series sees the arrival of the fearless Knights of Camelot and a fantastic guest cast featuring Gemma Jones (Bridget Jones' Diary, Harry Potter), Phil Davis (Doctor Who, Brighton Rock) and Nathaniel Parker.. 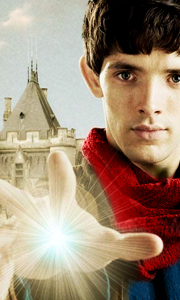 The epic fifth and final series of Merlin sees Camelot at the height of its golden age. With Queen Guinevere and the Knights of the Round Table at his side, Arthur has never felt stronger. But even as Camelot flowers, the seeds of her destruction are being sown... As the forces of darkness gather, only Merlin stands between Arthur and a fate that has been written since the dawn of time... Three years on from where Series Four ended, Mor..
Set in the mythical city of Camelot, in a time before history began, this epic, magical adventure-packed adaptation of the Arthurian legend follows young Merlin's enthralling encounters with the young Prince Arthur... Having settled in Camelot, Merlin, who was born with extraordinary magical powers, has been taken as an apprentice to court physician Gaius and as manservant to the headstrong Prince Arthur. However, with the practice of m..
Own Merlin Series 1 - Volume 1 DVD from Deff, DVD, Blu-Ray & 4K Video Specialists - Free UK Delivery..
Merlin is back with even more magic, adventure and romance as the young wizard struggles to protect Prince Arthur in the perilous world of Camelot. While battling deadly assassins, mystical monsters and the most powerful sorcerers Camelot has ever seen, Merlin must work harder than ever to conceal his unique abilities, as King Uther redoubles his war against magic. And Merlin isn't the only one whose destiny calls in this exciting first.. The magic of Merlin continues with more action-packed adventure, romance and suspense as the young wizard fights to protect Prince Arthur and safeguard the future of Camelot. As King Uther renews his deadly crusade against magic, Merlin finds it harder than ever to keep his unique abilities a secret while battling ruthless sorcerers, terrifying monsters and deadly warriors. In this gripping conclusion to Merlin Series Two, a Witchfinder..
Own Merlin Series 3 - Volume 1 DVD from Deff, DVD, Blu-Ray & 4K Video Specialists - Free UK Delivery..
Swords, sorcery and swashbuckling adventure return in this third series of the hit BBC series, following our heroes Merlin and Arthur as they face their greatest challenge yet. When misbegotten secrets are exposed and old friends choose new sides they soon discover that the great battle for Camelot is only just beginning... With epic action sequences, stunning CGI sequences, terrifying new monsters and a guest cast featuring Warwick Dav..
Own Merlin Series 4 - Volume 1 DVD from Deff, DVD, Blu-Ray & 4K Video Specialists - Free UK Delivery.. Heads and hearts are thrown into turmoil as the thrilling fourth series of Merlin continues. Morgana's terrifying campaign against Camelot reaches its climax, leaving the future of the kingdom hanging in the balance. Arthur must find the strength to become the leader his people so desperately need and Merlin must find the power to help him. Spectacular CGI effects, breathtaking action sequences, unforgettable characters and a stellar gu..